I am not a runner. For me, the thrill of endorphins coursing through the body is completely overshadowed by the potential for sweat, bad weather, and leg cramps. My father was an avid runner, but the running gene skipped a generation. My daughter, Meira, is a runner. She actually enjoys the challenge. Last weekend, Meira completed a half-marathon for the second time. That’s 13.1 miles! I think she is amazing. So, I baked her Marathon Cookies. 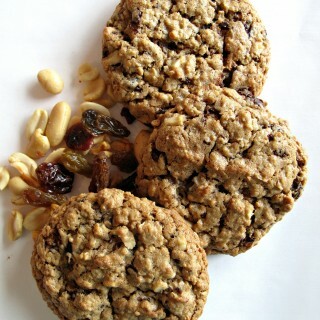 Marathon Cookies are a chewy oats and peanut butter treat, packed with dark chocolate, peanuts, and dried fruit. They happen to be gluten free. 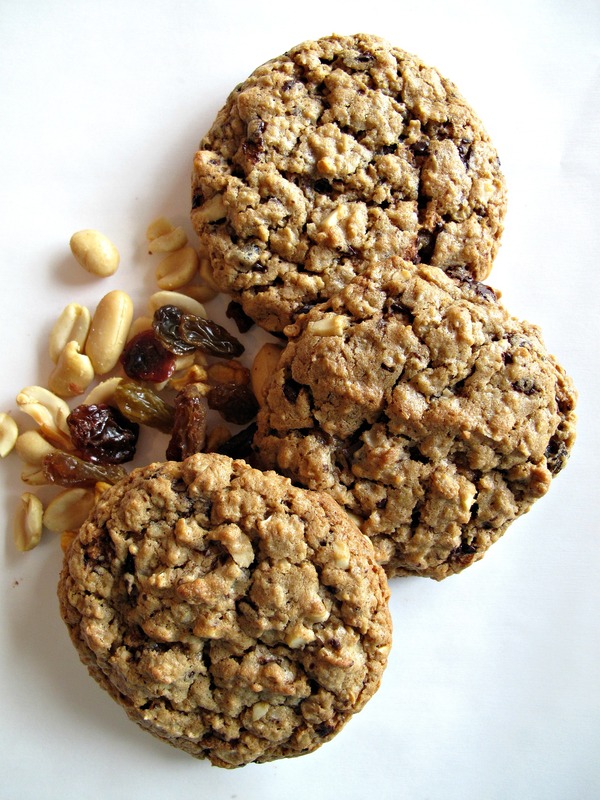 These cookies are great just for munching, but they also provide a boost of the nutrients a runner (or enthusiastic spectator) needs to keep going. 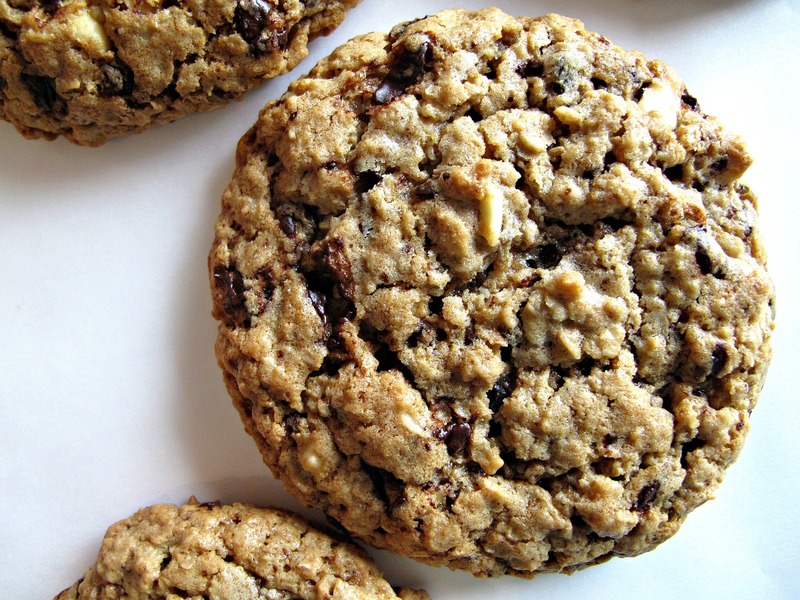 Marathon Cookies are like flourless monster cookies with nutritional punch. A small amount of protein powder in the dough is undetectable. 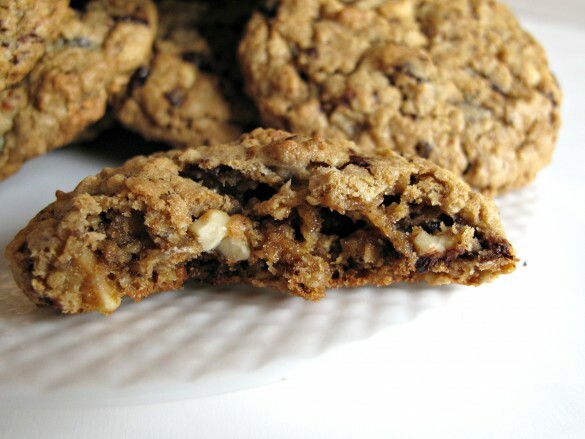 I experimented with adding different quantities of protein powder to this recipe, which seemed to be the easiest way to create nutrient rich cookies. Unfortunately, any more than 2 tablespoons was noticeable, leaving a dry, kind of powdery aftertaste. Lots of packaged high protein bars have that aftertaste. Because Marathon Cookies aren’t intended as protein bars, but scrumptious cookies with protein, I went with the lower amount. Feel free to double the amount if you don’t mind the aftertaste and need more protein. The protein powder can also be left out completely. Marathon cookies are good to eat before a long run, after a long run, or while standing along a race route, waiting to cheer as your runner passes by. 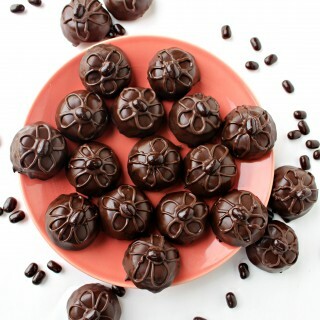 These peanuty cookies are also an irresistible, nutritious after school snack. With college exams around the corner, I will be mailing Marathon Cookies to Chicago, to help sustain my college son in his finals race toward graduation! Preheat oven to 350° F. Linea baking sheet with parchment paper. In the bowl of an electric mixer, cream together butter and peanut butter. Add granulated and brown sugars. Mix to combine. Beat in eggs (one at a time), vanilla, protein powder, and baking soda. Mix in oats. Then stir in chocolate, peanuts, and fruit bits. Using a medium (2 tablespoon) scoop, place balls of cookie batter 2” apart on prepared baking sheet. Cool on the baking sheet for about 3 minutes before using a spatula to transfer cookies to a wire rack to cool completely. When cool, store in an air tight container for up to 5 days. Double wrap pairs of cookies, bottoms together, in plastic wrap. 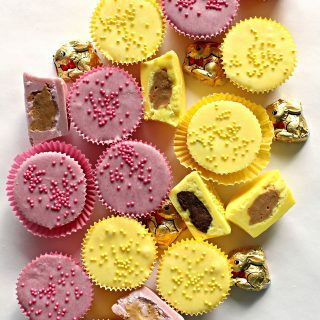 Place columns of wrapped cookie pairs in an airtight container or ziplock bag. Shipping cookies containing fruit is not recommended in hot weather. I love that you made these for your daughter – they sound fantastic! And so impressive that she did a half marathon! Sold! I’m a runner, and I love to eat cookies, so this is a win win for me. Thanks for posting. 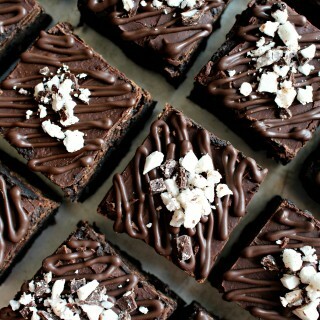 I’m definitely going to make these. And congratulations to your daughter on her second half marathon. That’s awesome! These cookies totally caught my eye, Wendy! “Flourless monster cookies” sound terrific and what a delicious, nutritious, treat for your awesome daughter! I wish I was more athletically inclined but I’m more the living room light workout kinda girl. : ) Seriously, I really want these cookies and I hope you send your son some too. Exams call for hearty cookies. We just visited Chicago recently – such great food in that city! Thanks, Monica! After making these, I wondered why monster cookies ever needed flour! Even if you are just trying for a tasty cookie (without regard to nutrients) the flour is just baggage. I may add almonds (supposedly brain food) to these when they morph from Marathon Cookies to Final Exams Cookies! 🙂 Next time you are in the midwest, let me know if you have time for coffee. 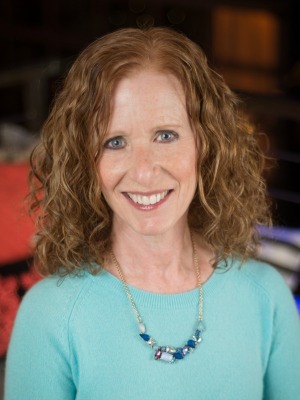 I am always looking for an excuse to head to Chicago and I would love to meet for “real”! 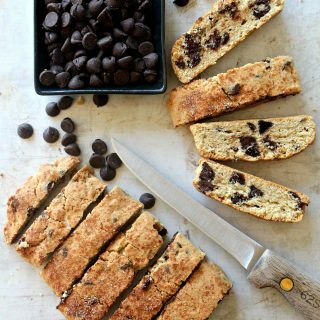 I just read about a new coffee shop in Wicker Park that specializes in scones! Oh I love this recipe! Peanuts, peanut butter, and oats – what a great combination. I want to try these with chopped dates too. Very nice Wendy! You can really work up an appetite watching the races! You are such a wonderful mom. Have a lovely weekend! Oh, these sound yummy and perfect for a healthy snack! I love peanut butter and I always think that oatmeal in cookies so good! These look terrific! As a gf-foodie, I will try this recipe out! 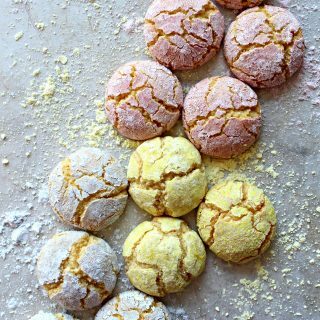 I am always looking for a great new gf cookie recipe to try out! Thanks for sharing! Thanks, J ! No one will know these are gluten free and you can customize the add-ins to your taste. I know you love them! very interesting…I love cookies and can’t eat protein bars cause I’m allergic to nuts. I will have to try (minus the nuts)! Danielle, you will need to address the peanut butter also, if you are allergic to peanuts. (I am allergic to tree nuts, so you will rarely find tree nuts in Monday Box recipes, but I personally am fine with peanuts. ) I haven’t tried it, but I would guess that soy butter or one of the seed butters would work. Probably cookie butter would be delicious but without any of the nutritional value. If you try one of these, please let me know how it turns out! These are just glorious! I love peanut butter and baking with protein powder!! And they turned out so beautifully! Thanks, Sam! I am now slightly addicted to these cookies and had to get the final 6 out of the house before I ate them too! Do you have recipes with protein powder on your site that you would recommend? This was my first attempt at baking with protein powder, and I wished that I could use more before it made the cookies sandy. For undetectable protein powder I could only include 2 tablespoons. Oh. My. Gosh. I’m making these this weekend! My daughter and I just started running together and we already LOVE to bake together! So this will be a perfect weekend activity! Thanks so much for posting this recipe! Wishing you and your daughter lots of energetic runs! 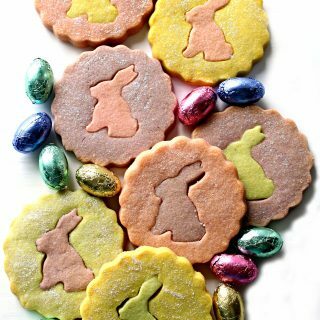 I hope these cookies give you a delicious boost….or at the very least, a delicious reward for your hard work! 🙂 Whether running or baking, doing stuff together is the BEST! I am definitely not a runner but these look like something I would enjoy. You always have such great things on your blog. Thanks so much. These cookies look amazing, and just perfect for a walker too! 🙂 I love the idea of sending them off for final exams. My guys will be taking them next week. I should probably send them a box of these . Congratulations to your daughter! Great achievement. Thanks, Karen! The Monday Box this week was a mix of brain food for exams and chocolate for stress. 🙂 Considering the unusual hours college students keep, in general and especially during exams, a little extra protein and energy boost is a good thing for snacks or for on the run breakfast! Your daughter is lucky to have a mom baking these for her! I am a runner and love the idea of protein snacks. My son and I make energy balls that we call “Yummy Balls” (this weeks post will be about that!) These sound delicious. I might have to make these! Do you know calorie content on them? Thanks, Crystal! I will definitely check out your “Yummy Balls”. Everyone can use some extra energy, running or not! Sorry, I don’t know the calorie count. So much depends on the brands you use for peanut butter and protein powder. I do know that we made a batch subbing Swerve for the white sugar (thereby lowering the carbs and calories) and the cookies were still delicious. We are totally on the same recipe wavelength this week, Wendy! 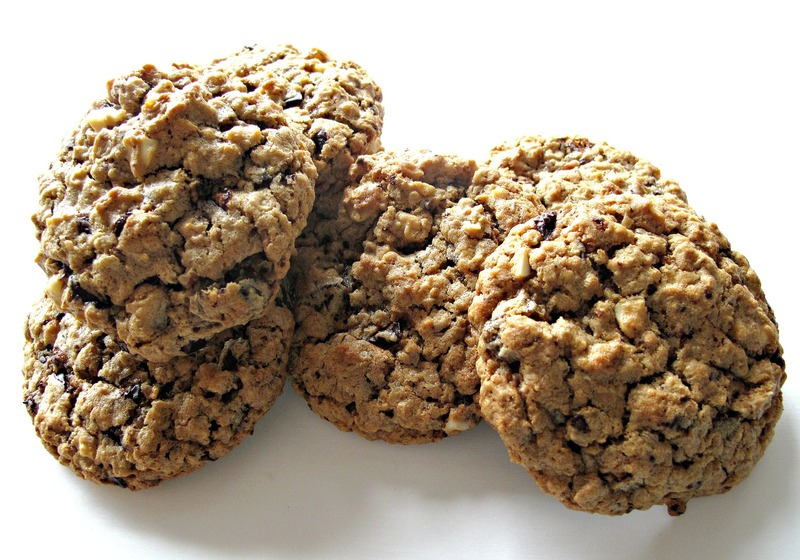 I love baking oatmeal cookies for my GF husband, and you for your daughter. I find that cool. 🙂 Yours look so good! And the protein powder is a great idea for a post-workout boost! Brilliant minds, right Mir?! 😉 I know there are those who will think this crazy, but I love oatmeal cookies WAY more than chocolate chip. They are so satisfying, you can pretend they are healthy, they can be made deliciously gluten free, and you can add in chips and/or fruits to change things up. 🙂 I am adding your oatmeal cookie recipe to my collection! These look wonderful. Like a lot of other commenters, I am not a runner, but my other cardio activities probably mean I deserve these cookies too. I am looking forward to trying these! 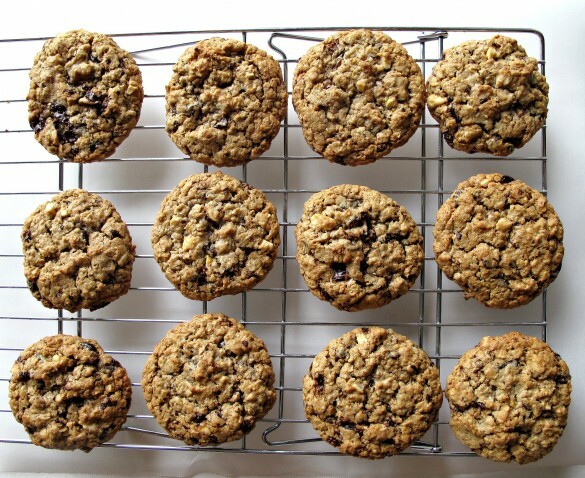 Ooh these look quite yummy, and the recipe is similar to a lactation cookie recipe – with all the healthy ingredients 🙂 Good for you making marathon cookies to show your support. Thank you, Julie! I wish I had know about lactation cookies decades ago when I was a new mom! Any excuse for a cookie works for me. 🙂 These Marathon cookies are delicious for any activity! Congrats to Meira! That’s amazing: i think anyone is amazing for being able to run…well, let’s get real, basically I’m amazed that anyone can run for any length of time b/c i’m also not a runner. 🙂 Like i’m horrible at it, and although i can walk for probably days at a time, ask me to run…different story. So she has my respect for those 13.1 miles…and you have my total love for making these cookies for her. So sweet! Have a great run, Cindy! Good luck! I hope the cookies add a delicious boost to your marathon walk/run! Yummy! Such a delicious snacks. They seem so easy to be prepared!